i went outside the house this afternoon despite the heat that melted through the concrete and reached pipes buried underground and made the water from the tap come out warm. 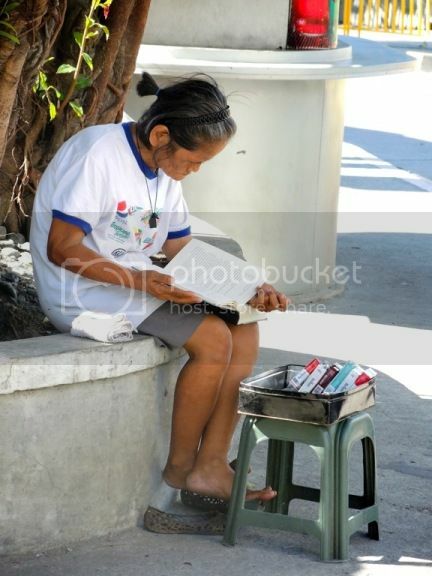 i needed to buy something, and i almost missed this old lady sitting under the shade of a tree at the corner of malugay and gil puyat. she was reading a book. in front of her was a small plastic stool that carried a few items she was selling: mostly cigarettes. that’s not unusual, because these ambulant vendors normally amuse themselves with romance novellas to while away lazy days when foot traffic is minimal and the sales are low. but i immediately noticed the size of her book: the pages were huge, and it was thick. the old woman was so engrossed with what she was reading that she scarcely looked up when someone came by to pick up a stick. in fact, she didn’t notice me when i leaned over to try to see what she was reading. i was curious if this woman was just leafing through a book she found lying around somewhere. finally i had to quell my inquisitiveness and had to ask her what she was reading. i had to say it twice since she couldn’t be bothered -- she was close to the ending. what are you reading? i said again, and she turned the book around. it was “the time traveller’s wife”. is it good? i asked, not having read it myself. yes it is she replied. what’s the story? oh i shouldn’t tell you, she said. you should read it yourself. i felt a little embarrassed and a little illiterate as well, as though her reply suggested i don’t read. in fact i do read, a lot more than most people i know, but not enough. i used to read all the time. when i started working in makati as a junior associate for a law firm, i would fill all my vacant hours reading. i read j.r.r. tolkien’s books, starting with “the hobbit” and until the start of “the return of the king” on my daily commutes until my eyes just gave out from the bumpy rides and dim light of public buses. during one holy week after my sophomore year in college, i finished gabriel garcía márquez’s “one hundred years of solitude”. when i fell ill while i was in singapore studying at the national university of singapore, i finished three of garcía márquez’s novellas. before i had permanent internet connection here at home i tore through several novels of ian mcewan. now that i have too many other distractions, i don’t read as much, although i do have a lot of books at home. when people tell me i’m a wide-reader, i have to correct them and say merely that i am a bibliophile. i like to buy books and look at them but so many of them sit on my shelf unread. so the old woman’s response was a bit of a brutal reminder for me: i should read, and read some more. i don’t read so i can tell people about it. i read because it actually entertains me. or angers me. or makes me think. 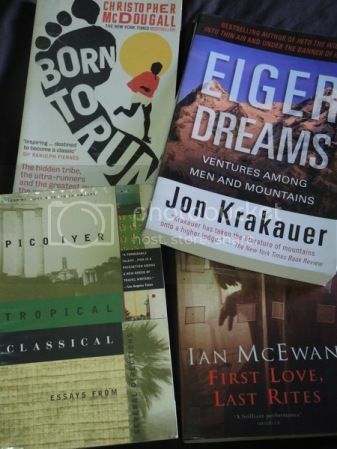 currently, the books that occupy the empty space on my queen-sized bed are the following: christopher mcdougall’s “born to run”, pico iyer’s collection of essays, mcewan’s short story collection, and jon krakauer’s “eiger dreams”. i’ve actually not gone past chapter 3 of “born to run”, since i was findng myself reading on true accounts of travel and adventure (well, mcdougall’s book has a little of both), but i’ve been getting works of iyer ever since a former editor compared an essay i wrote to him (i didn’t know him previously) and also of krakauer when i happened to read his account of that tragic time in mount everest. now i think of myself as a pinoy version of krakauer -- nothing can be more pretentious, i know, but indulge me that fantasy. currently i have two more of his books waiting to be read -- first i have to wrap them in plastic. i used to hold on to very elitist ideas about the literature that i read, and snorted at people who would suggest i grab a copy of some best-selling author’s work. i still wouldn’t bother to open anything by JK rowling or stephenie meyer, but now, my opinion of people who do read their books has relaxed. what’s important is that people read, even if it’s “sweet valley high”, which my sister had lots of while she was in her teens. it really does take you places, even when you’re just seated, hunched over creamy pages having that distinct smell of ink and paper. i hope to see the old woman again one of these days. she mentioned to me that someone had given her the book. since she's almost done with it, i want to give her one of mine, so i could share my world with her.